Man muss sich auch nicht normaler machen, als man ist. tip: Mr. Jaroussky, your new project is devoted to the most important student of Monteverdi, Francesco Cavalli, who also composed the opera “La Calisto.” Why did you choose him? 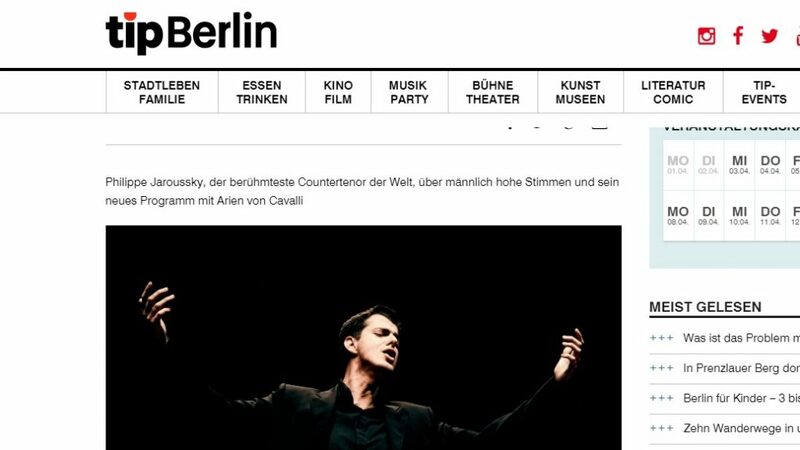 Philippe Jaroussky: He deserves it. I would rather compare him to Händel or Vivaldi than to his teacher Monteverdi. He was the first one whose tunes were short and simple enough to be catchy like pop songs. A genius! In his 27 surviving operas, his work exceeds everything that has been preserved by Monteverdi. I have known him since I started. But only now, when many of his operas are being rediscovered and set in scene, I plucked up the courage for this project. tip: The CD is called “Ombra mai fu”. It brings to mind Händel, or doesn’t it? Philippe Jaroussky: Perhaps I chose the name for the program to provoke. As musicology tells us, Händel’s famous “Ombra mai fu” wasn’t composed by Händel in the first place, but by Bononcini. Both made use of a libretto that Cavalli already had set to music. In plain terms: this program is my most original one so far. tip: Your career started 20 years ago. Today you are, we may say, the most famous countertenor in the world. What has changed? Philippe Jaroussky: I turned 41 in February. Everything that happens now is a bonus. If I quit singing tomorrow, I would be just as happy. But only now, with this album, I stopped to pretend to be younger on the cover art than I really am. Enough with the make-up; enough with Photoshop! tip: When you started, occasionally, there was a bright laugh in the audience because your voice type was considered a joke. Are these times over? Philippe Jaroussky: Until four of five years ago, this could very well happen. In TV shows, I still get prompted the question whether I am a castrato. And you know what? I don’t really mind. We still irritate people. So what? There is no point in trying to be more normal than you actually are. tip: Similar to Cecilia Bartoli, who avoids very large houses, your voice is not the largest. A disadvantage? Philippe Jaroussky: My voice has grown and is big enough to be heard at La Scala in Milan soon – by the way, together with Cecilia Bartoli. It’s never about the size of a voice but about the projection. When bad actors shout, no one can hear them. When good actors whisper, you understand every word.tip: Do you perceive your voice as male – or not?Philippe Jaroussky: Voices of countertenors are high male voices. I hate it when they say we sound female. I never try to imitate a woman. And because I sing male roles, it would not make any sense. tip: Do you have a personal theory why so many countertenors are gay? Philippe Jaroussky: I am. But that doesn’t mean that all, or even the majority of countertenors are. I only realized one thing: on stage, love scenes with a woman are a lot easier to do when your stage partner knows you’re gay. The only challenge is not getting a laughing fit. Otherwise it’s pure fun.